Steph is a health and wellness practitioner who has studied and worked in the health industry for over 10 years. Steph began her career as an Occupational Therapist in 2008, subsequently worked in a variety of mental health settings and completed three years of Post Graduate study in NZ and abroad. 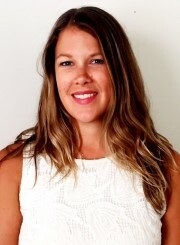 After developing a strong interest in holistic health and wellness, Steph completed her yoga teacher training in Bali in 2013, and also began practicing from a wellness coaching and preventative medicine perspective. Steph is an advocate for incorporating yoga, mindfulness and meditation into your life. Her consultations, groups and therapeutic style are holistic, refreshing and individualized. With a growing focus on leading healthier lifestyles, Steph can support you to achieve this by assessing your individual needs, goals, personal habits, and making recommendations based on exercise, nutrition, and stress management. You will walk away with simple solutions that you can incorporate into your day to lead a happier and more fulfilling life, leaving you more motivated and energized. As we know and love that we are all so different, your individual needs will guide sessions and recommendations will be based on you. As we are becoming more aware of the impact that our happiness has on our mental and physical health, taking our lifestyle, stress levels and health goals into consideration is essential. Maintaining a healthy body and mind is known to prevent illness and promote positive wellbeing, which is increasingly becoming known as ‘preventative medicine’. Health and wellness assessment and intervention is explored from a physical, mental and spiritual health perspective. Small group and one on one yoga, yoga therapy, mindfulness and meditation. Health and wellness coaching, with a focus on preventative medicine. Work stress and burnout and supporting others to align with their values in order to live a balanced and fulfilling life. Motivational coaching.